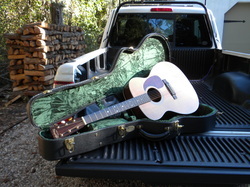 My first guitar was a Stella steel string, which I rescued from a dark corner of my grandfather's attic. The year was 1964 and while the Beatles ruled the AM radio my musical interests were in a different direction. I was fortunate to have as a family friend a man named Wes Rooker, who was the choir director at our church when I was a child but went on to become a music teacher at a private school in Newport, Rhode Island. But Wes had another job - he was for the years of 1964 - 1969 the Purser of the legendary Newport Folk Festival. He and his wife Dori took a special interest in me, which included introducing me to folk music. And what an introduction it was! I was able to meet and speak with many of legendary figures of the folk music world at their home while the festival was going on, people like Pete Seeger, Peter Yarrow of Peter, Paul and Mary, Theodore Bikel, Judy Collins and many others. What these musicians had in common of course was the guitar, and I knew playing it was something I had to do. At Newport I was able to sit a few feet from many of the legendary bluesmen, all gone now, including Mississippi John Hurt, Rev. 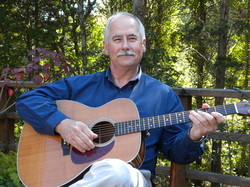 Gary Davis, Bukka White and also many of the great, young contemporary songwriters like Dylan, Tom Rush, Joni Mitchell, James Taylor, Jerry Jeff Walker and so many others. Being that close to these guitarists I was able to at least absorb things like timing, dynamics, audience interaction and so much more, even if I could only play a small fraction of what I heard. Not long after college I moved to Cambridge and became active in the music scene there, playing with singer/songwriter Elizabeth Kent and playing places like Passim and The Sword in the Stone. I also began exploring the electric guitar, initially playing blues and then moving on to swing jazz. In the early 1970s, Cambridge and Boston were loaded with bars, cafes and coffee houses where you could hear just about any form of music and meet excellent musicians, known and unknown, on a nightly basis. I met many and played as many styles of music as I could. I also began teaching a few students and found it was gratifying - and it forced me to radically expand my repertoire. After moving to Cape Cod I met fiddler Marie Rhines and we went on to tour all over the country, playing festivals and concerts from New England to Georgia to the Pacific Northwest. In the late 70s we recorded Marie's album "The Reconciliation" for Philo Records. By the mid 80s I was touring less but playing out more on a local basis and began teaching full time out of my studio in West Falmouth. I played in many groups between then and now, from duos to full 12-piece ensembles. Blues, jazz, rock, country, even a bit of Irish and bluegrass music. Some studio work doing commercials and doing demos with the various groups helped me learn recording technique. I loved it all and I still do!